There is such a thing as birthday anxiety. It is not something I suffer from. Uhm..about 363 days every year I suffer from birthday anticipation. There’s one day also of birthday aftermath. Nevertheless, there are those who don’t want to draw attention to their birthday, fail to mention the date, shy away from big plans, and are overwhelmed by the thought of everyone spoiling them. One 24-year-old British lifestyle blogger recently posted on her own birthday in solidarity with those who meet the day with dread or sadness. The influencer, who gained fame for YouTube beauty tutorials, tied her birthday with feelings of loneliness and expectation, as well as pressure, guilt and disappointment. We’ve discussed this before. Also, there are people who share their birthdays with anniversaries of loss. 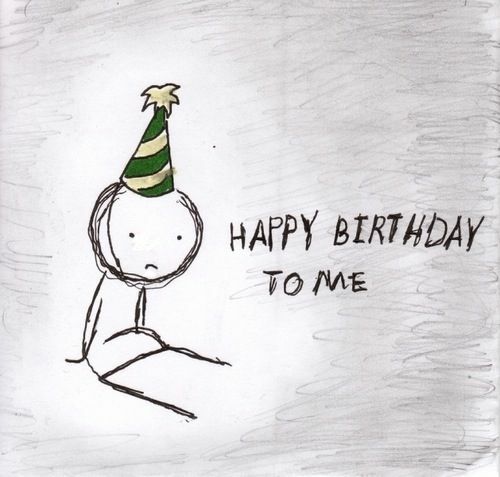 So, of course, there’s such a thing as birthday anxiety. I only hope this blog isn’t making people feel worse — although I doubt the birthday worriers are the ones following my blog. And anxiety, for that matter…. I’ve decided to take a hiatus from weekly publishing. I love writing this blog. It entertains me, and I hope it does you too. However, it has also become one more pressing item on my “to do” list. And, as I’m doing this for fun, I have decided to take a break from this obligation for a little while. At least until I can come back to it with a level of excitement like I had when I first started writing. Thanks for your support in the meantime. I’ve appreciated your eyes on my words! As a huge Alias fan, I’ve always really admired Jennifer Garner. Where others might say they could see themselves being friends with Jennifer Aniston, my imaginary celeb best friend would be Garner. Nonetheless, I love what says about friendship and birthdays. It doesn’t matter how rich or poor, famous or not you are (and your friends are), you still want to celebrate birthdays and let friends and family know they are loved. Aliasbirthday greetingscelebrity birthdayJennifer GarnerReese Witherspoonwho is your celeb gal pal? As you can easily imagine, I’m all in favor of signing a group birthday card. Yes, it can be challenging to come up with something distinct to write when 15 other colleagues or peers are signing the same card, but it’s the thought that counts, right? Nevertheless, I did get a chuckle out of the kerfuffle surrounding a recent call from the GOP to sign a virtual birthday card for Eric Trump. Someone had the idea to enlist all the nation’s Republicans in sending well wishes to the President’s second son for his 34th birthday January 6. Now, of course I wish everyone a happy birthday — regardless of whether or not I agree with their political views. But, I have to agree with the many people pointing out that it’s odd for the GOP to be asking people to recognize the birthday of a private citizen, just because he’s related to the President. Plus, really, what kind of “personal message” are you supposed to add when writing to an individual you have never met? I began this blog with a mention of my difficulties coming up with something personalized to say on a card when I was chiming in on one that several people had already signed. And that was for someone I at least know! In doing this blog I even discovered on Facebook a Card Shower Club that brings together volunteers to help people commemorate milestones. Check it out! This one may make you a little sentimental. After all, it’s about a thoughtful Dad who arranged to have flowers sent to his daughter on her birthday — after his death. Upon finding out his cancer was fatal, the Dad went to a local florist and prepaid for an annual birthday bouquet. He died when she was 16, but each year until she reached 21 she received flowers and a card. “Bailey, this is my last love letter to you until we meet again. I do not want you to shed other tear for me baby girl, for I am in a better place. You are and will always be the most precious jewel I was given. It is your 21st birthday and I want you to always respect your momma and stay true to yourself. Be happy and live life to the fullest. I will still be with you through every milestone, just look around and there I will be. I love you boo boo and happy birthday!!!!! And that right there is why I love birthdays. They are an opportunity to take a moment and say the things to each other that we don’t stop and say every day. This Father had another impetus, yes, but we could all benefit from embracing the birthday as that day to openly say what is in our hearts. Netflix is looking to become even more enmeshed in our day-to-day lives. How so? The company this month announced an “easier way to make kids’ birthday dreams come true.” The fact that their initiative will only further enhance kids’ loyalty to Netflix characters is conveniently downplayed in the streaming service’s PR for its 15 Birthdays-on-Demand. Instead, the company focuses on the pressure parents feel to make a birthday special. Unwieldy headline aside, “New Netflix Hack Helps Parents Blow Out the Candles on the Birthday Party Hijinks,” the press release is a smart one. It even incorporates a survey into the discussion of its new service to add credibility. OK, it’s a cute idea. I’ll likely even set up a Ninjago or Trollhunters one for my son come February. But, let’s be honest here. This is not the be-all end-all solution to birthday party angst. This is likely to be less than five minutes of fresh entertainment related to my kiddo’s birthday. That still leaves me with a birthday party to plan, cake to bake, and balloons to blow up. Really, Netflix has just added one more thing to do. Because once a kid hears from her friends about getting a birthday greeting from Luna Petunia, she’ll be wanting one for herself too. Even putting the whole product release in terms of making life easier isn’t going to distract me from the fact that the streaming service is looking to find another foothold into the imagination of children. But, nicely played, Netflix. Nicely played. The headline on a recent story had me thinking, “so what?” After all The Daily Times was reporting: “Mail Call: Friends swap birthday greeting back and forth for 20 years.” I was thinking, I have plenty of friends I have been wishing birthday greetings to for more than 20 years! But I did read on, and I’m glad I did. It’s a fun thing Sherry Hillis and Patsy Lunde have done for decades. They’ve been sending the exam same Peanuts cartoon birthday card back and forth. The same one — for 20 years. But, what really makes the card special is the things they have written to each other over the years. Lunde even added pages to the card so that the two women could continue to catch up with one another every year. Lunde first picked out the card first for Hillis’s Sept. 1 birthday. Hillis turned around and sent it back to Lunde for her birthday just days later — Sept. 5. That’s what they’ve been doing annually even as their careers took them in different directions — they started the tradition while both employed at the same hospital — and the children that they first met through (the girls swam together in school) grew up. “Hallmark is losing money on us,” Lunde said. I want to start this tradition with my friends right now! I love the idea of having an annual catch-up outside of the now obligatory Christmas card. The card that serves as an annual reminder also of what has come before and how much we friends continue to mean to each other. Really, find someone you love, and start sharing a time line birthday greeting today. It will add even more to both of your special days.